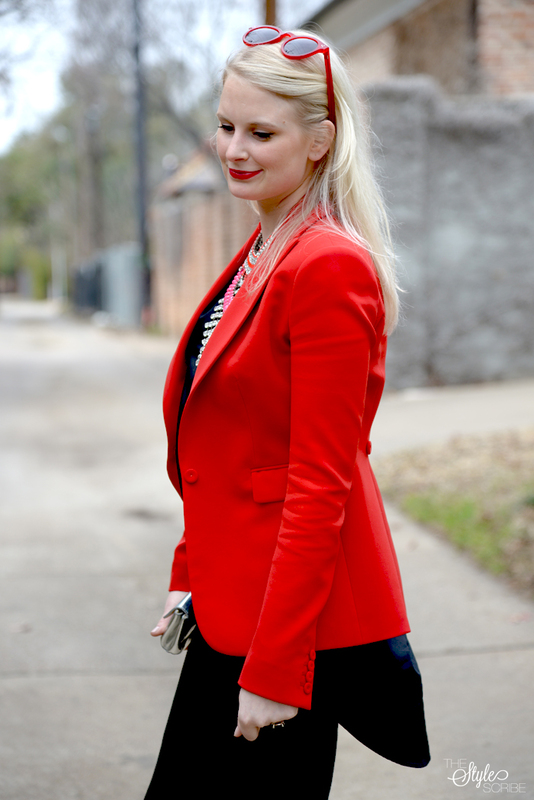 As you know, red has been a favorite color of mine as of late and with Valentine’s Day coming up I wanted to break out my new Joseph blazer! It is such a gorgeous shade and gives any outfit just the right pop of color. I’m on the lookout for a skirt or pair of shorts in a matching hue so I can do a monochromatic look next! Also searching for a pair of mirrored pumps to match this old Furla clutch of mine. Thinking these would do the trick! You look beautiful! The title should have been gorgeous in red, this color looks amazing on you. Those necklaces are stunning paired together! Looks like they’d get heavy — I’m such a wimp, my neck can’t handle heavy necklaces for very long! they’re actually very light, but I can see what you mean – it’s definitely a big look! Girl this is beautiful!! I love the necklace with it! Great styling! OBSESSED with your necklace! It’s super versatile and fun! In love with the bright red! The contrast is gorgeous and the necklaces layered look beautiful. I have a Hermes silk scarf giveaway on my blog, would love for you to pass by and enter! Again with another impeccable outfit! 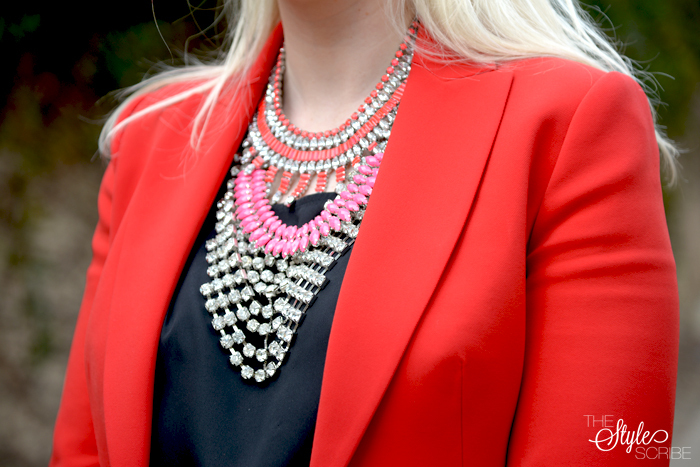 The pop of red with the blazer is just so sharp and then the layered necklaces takes it to a whole other level. Absolutely adore your sense of style! ohmyyyyy, the necklace absolutely stunning!! I want it now.